The winds of change in Singapore have buffeted Marina Bay the hardest, but the results have been pretty amazing. From an overgrown parcel of reclaimed land flanking the Singapore River’s outlet into the sea, the area has been rapidly transformed into Singapore’s most modern business and pleasure district. The skyline, once flat and unremarkable, now boasts highlights like the Marina Bay Sands, the Singapore Flyer, and the “supertrees” of the new Gardens by the Bay. So what’s in it for you? Plenty, actually – the area’s many new (and a fair bit of old) attractions will keep you occupied while you visit, with a wide selection of dining, entertainment, shopping, and culture, easily accessible by taxi, bus, and MRT. Train riders armed with Singapore’s EZ-Link card can reach the Marina Bay and its environs through the following MRT stations: Raffles Place (NS26/EW14), City Hall (NS25/EW13) Marina Bay (NS27/CE2/TS20), Bayfront MRT Station (CE1/DT16), Promenade MRT Station (CC4/DT15), and Esplanade MRT Station (CC3). Changi Airport isn’t the only place in Singapore that can launch you high in the air. For a unique 30-minute “flight” with obstruction-free views of Marina Bay and nearby Malaysia and Indonesia from 540 feet above the island, book a session at the Singapore Flyer (singaporeflyer.com). The gigantic observation wheel’s 28 air-conditioned capsules can accommodate up to 28 riders each. The “flight” consists of a half-hour, single revolution; the slow and steady climb and drop let you drink in the 360-degree views to your heart’s content. For the experience in pictures, check out our Singapore Flyer image gallery. For another sky-high perspective on the Marina Bay district, visit the Marina Bay Sands Skypark on the hotel’s 57th level. The Skypark rests on a three-acre platform housing a restaurant, nightclub, a viewing deck, and an infinity-edge swimming pool. From the viewing deck, Marina Bay at nighttime looks like a sparkling galaxy brought down to earth. For more details, read our review of the Marina Bay Sands Singapore. Singapore is busy growing its arts scene, and much of the action is happening right in Marina Bay. For the theater and performing arts scene, visit the Esplanade - Theatres on the Bay (esplanade.com; pictured above), a theatrical arts venue particularly notable for its durian-like prickly exterior. The Esplanade hosts over 3,000 arts performances, workshops and exhibitions across every conceivable artistic venture. Its most high-profile performance event takes place during New Year's Eve, when its outdoor stage hosts local and international musical artists ringing in the New Year. Find out “What's On” at the Esplanade, now and in the next few months. Some of the hotels in the Marina Bay area also have art collections of their own: the Ritz Carlton Millenia has a four-million-dollar collection distributed through its lobby and other public spaces, while the Marina Bay Sands has an artwalk with work from some of the world's most talented modern art masters. Compare rates on Marina Bay, Singapore hotels via TripAdvisor. Marina Bay is full of top-flight shopping centers and malls (check out our rundown of shopping centers near City Hall and Marina Bay for the complete list), but one particular shopping area stands out. The Suntec City Mall (sunteccity.com.sg) is a modern shopping mall through and through, but an atrium in its center features a large token of good fortune: the “Fountain of Wealth”, an 85-ton cast-bronze ring fountain that towers over 46 feet high. A steady stream of water flows inward from the ring, spouting toward the center of the atrium – according to feng shui principles, the inward flow symbolizes wealth pouring into the mall. The 101-hectare Gardens by the Bay superpark recreates a number of climates from all across the globe in two climate-controlled Conservatories - visitors can take a break from Singapore's unremitting humidity by entering a "flower dome" that recreates the Mediterranean climes, or get lost in the "cloud forest" that duplicates tropical mountain weather. The conservatories harbor a number of plant species exclusive to each climate. Don't leave without ascending the Gardens by the Bay's main contribution to the Marina Bay skyline: the "supertrees" rising over 16 storeys tall, linked by a walkway suspended over seven storeys above the ground. The "supertrees" are technologically "green" marvels - covered in flowering plants, ferns, and vines, they collect solar power and rainwater for use in the complex, and they also help vent exhaust from the conservatories around them. With roots in the international Red Dot Design Awards instituted in Essen, Germany, the Red Dot Design Museum (museum.red-dot.sg) maintains a cutting-edge collection of over 300 design works, showcased in an angular glass-and-steel building along the Marina Bay promenade. The exhibits symbolize the high-minded principles of the Red Dot Design Awards: products and ideas adjudicated by the Red Dot Awards jury to meet the highest standards in product and communications design, and awarded the Red Dot quality seal. The exhibits are almost discipline-agnostic, covering consumer products, works of art, and marketing materials. The most recent exhibit in the Permanent Collection – Human-Nature – studies the division between people and technology – and probes how human nature bends (and threatens to break) in a world suffused with machine learning, big data, and autonomous robots. Visitors can take samples of the Red Dot’s designs home with them, by checking out the design shop – filled with souvenirs from both international and Singaporean designers. With an area of 161,000 square feet, the Casino at the Marina Bay Sands accommodates over 15,000 patrons across four gaming levels, promising the "Sands" Las Vegas experience on the other side of the world. Within these glitzy, modernistic hallways, patrons can try their luck on more than 600 table games and over 2,500 slot machines and electronic table games. Between sessions, you can exit to the Shoppes at Marina Bay Sands or dine at one of seven attached celebrity chef restaurants. For more details, read our review of the Marina Bay Sands Singapore. If you're a newbie on the casino floor, read this primer on navigating the casino. The second half of September every year brings Marina Bay to a near-standstill, as the Formula One Grand Prix arrives on Singapore’s streets. And we mean that literally – the Singapore Formula One race is the only night race in the Formula One calendar, and is held right on Marina Bay’s own roads. Singapore’s Marina Bay circuit is 3.14 miles long, adding up to a total length of 192 miles when all 61 laps are accounted for. The circuit takes the drivers through some of Singapore’s best tourist spots, and right by the new Formula One pit building. Not all the rave reviews come from spectators – as F1 champion Lewis Hamilton commented on the local race, "the track is fantastic, the fans here are amazing, and they put on a great show here in Singapore." 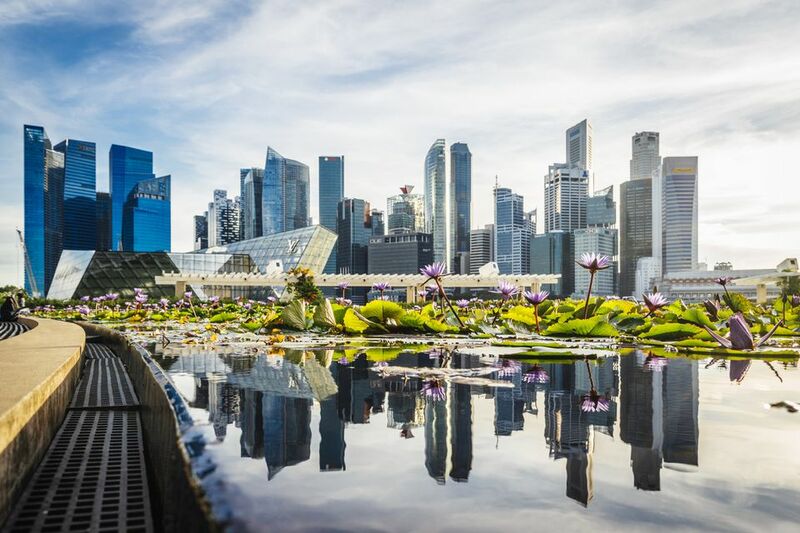 Marina Bay preserves Asia’s past and present through two establishments in particular: the ArtScience Museum and the Asian Civilisations Museum. The ArtScience Museum (marinabaysands.com/ArtScienceMuseum) is located in a lotus-like structure set apart from the Marina Bay Sands complex, right on the bayfront. Inside, exhibits are set in 64,500 square feet of gallery space over three floors. The Asian Civilisations Museum (acm.org.sg) unravels Asia’s cultural threads in a series of interactive displays – the fact that you can’t see the whole thing in a single visit says a lot about the region’s cultural diversity! Themed exhibits take visitors through ethnographic tours of the cultures of China, South Asia, West Asia, and Southeast Asia, helped along with authentic artifacts from each culture, like a Chinese snuffbox, a sword collection, Chinese pottery recovered from a shipwreck, and an ancient Buddha statue. A few enterprising Singaporeans transformed a relic of the Vietnam war into an amphibious tour bus that cruises on Marina Bay’s roads and the bay itself. Singapore’s DUCKtours (ducktours.com.sg) takes guests on a unique tour of the city-state's historical district – you won’t only see the Marina Bay district’s gleaming new buildings from the road, you can also take to the Singapore River and imagine how the 19th-century traders must have seen the bustling trading port from their boats. Tours depart every hour from the Suntec City Mall. For more conventional water craft, book a tour aboard a “bumboat” replica from Singapore River Cruises (rivercruise.com.sg); package tours, “river taxi” services, and charter services are available. Singapore’s reputation as a stodgy business-only place is less and less deserved these days, as the rules have been steadily relaxed for some time now (table dancing was only made legal in the last decade). In the Marina Bay area, partygoers can enjoy the newly emancipated party atmosphere in places like CHIJMES (chijmes.com.sg), a former Catholic convent converted into a happening nightspot crammed with bars and restaurants. The aforementioned Marina Bay Sands has captured the bulk of the party crowd in the past few years, thanks to a few new establishments within the premises: the Ce La Vi Club Lounge, the Club55 lounge, and Flight, a bar whose 57th-floor location promises an awesome view of the Marina Bay area. The food scene in the Marina Bay district captures the “high end” of the culinary scale. While you’ll still find plenty of hawker stall eats around the Marina Bay area, you’ll find more than your fair share of fine dining experiences along the district’s many hotels and shopping centers, too. Again, the Marina Bay Sands has captured the market with its “celebrity chef” restaurants, captained by some of the culinary world’s most notable names. CUT showcases Chef Wolfgang Puck’s version of the classic American steakhouse; db Bistro Moderne introduces guests to French bistro dining via Chef Daniel Boulud; and Osteria Mozza (pictured above) presents Chef Mario Batali’s take on classic Italian favorites. Foodies can also raid other areas in Marina Bay: the Suntec City Mall and CHIJMES (chijmes.com.sg), both of which feature a wide array of restaurants within a few minutes’ walk of each other. For a one-stop hawker food experience in Marina Bay, Makansutra Gluttons Bay serves up hawker food favorites from all across Singapore, including a kaya-coated fried banana dish that still lingers in this writer's dreams.